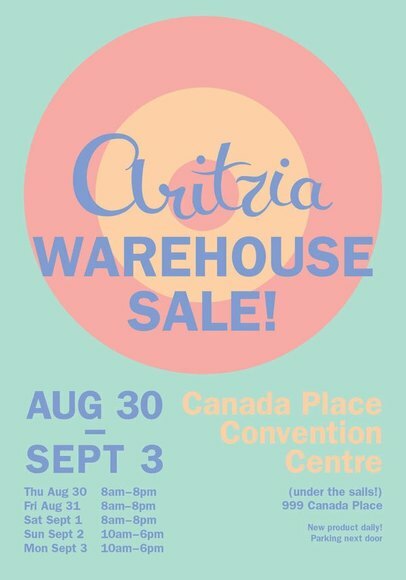 I went to Aritzia Warehouse Sale today! I sadly was not a friend nor a family of someone who worked at Aritzia. However, I was lucky enough to get invited to tag along with Emicably Yours because she knew an important person who's in charge of the operations of this sale. The sale for Friends and Family apparently started at 4pm. I got to Canada Place at 5pm and the line was very long already. I felt like there was 150 people ahead of me. I took about 20 minutes to get in. Everyone in line had these little cards that signified that you were indeed invited to this private sale before it goes public tomorrow. I got black TNA spandex cropped leggings (hits me mid calf) for $30 in XS (reg $50). I needed these because my mother keeps on stealing my leggings and I seriously have one pair now down from 10. 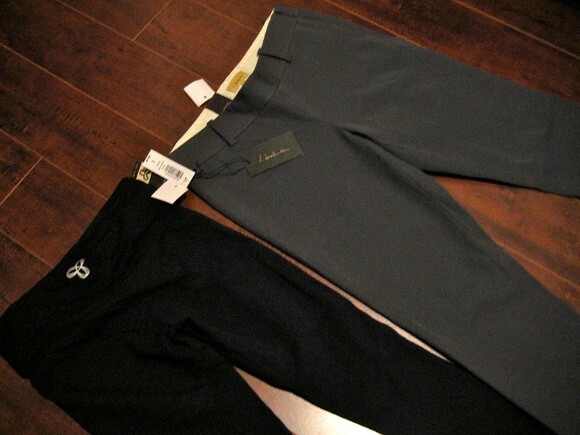 My favorite purchase of all was the T. Babaton Elliot pants in grey in size 2 for $50 (reg $95). These I found thrown ontop a clothing rack bunched up in a mess. It was a miracle, a size 2! I found bigger sizes like size 6 or 8 in grey and surprisingly one size 4 in black. I have these pants in black and periwinkle blue and I love the fit. 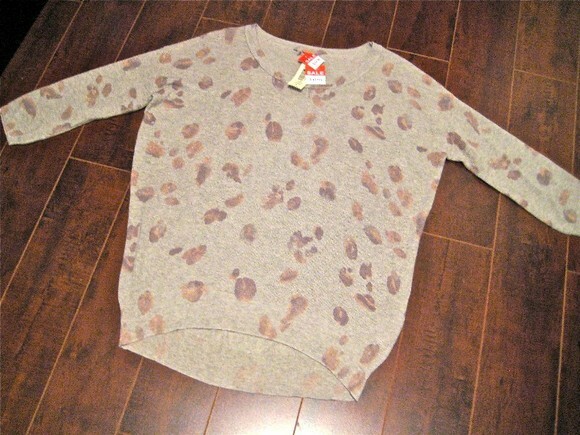 The second best steal I got was the Wilfred silk cashmere blend blob print sweater. They are so soft to the feel. I got it in a size S for $50 (reg $115). It's a baggy sweater so the sizing is forgivable. I had a girl ask me if she could have it if I didn't like it. But I liked it so I kept it for myself. As I was walking around, I saw the same sweater in the same size but felt bad that I never saw that girl again. These sweaters were hard to find. 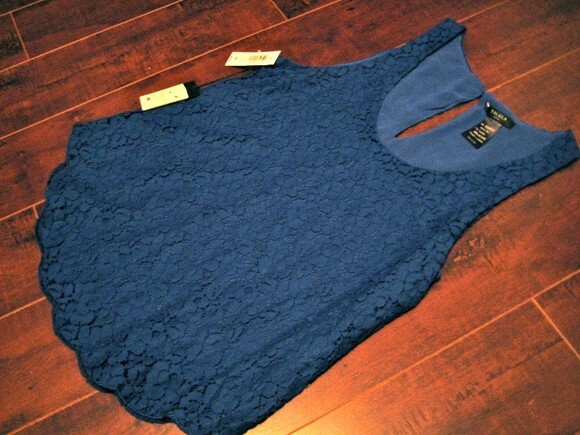 I got this Talula lace tank top for $24 in XS (reg $48) . There wasn't a price on it so the cashier gave it to my for 50% off. I got some of the signature tank tops I wear, the T. Babaton second skin tank tops. 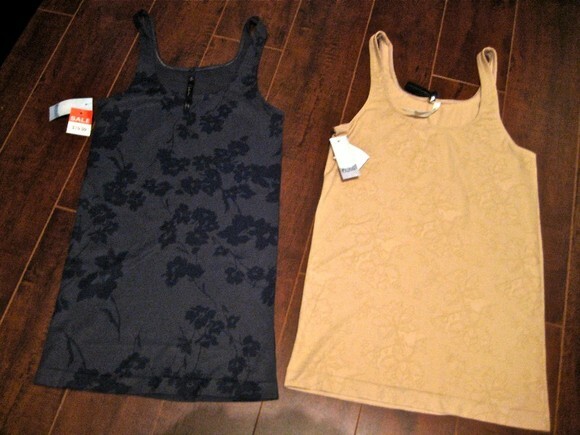 I got the dark grey floral one for $20 in a M (reg $40) and the beige lace print in a L (reg $40). For the T. Babaton tanks, I find one has to go up several sizes because of the stretchy material. - Drink lots of water and eat a good meal before the sale. You don't know how long you are going to stay here. I didn't intend to stay for 4 hours but it just happened. - The best items are found NOT on the neat clothing racks but on the floors in messy piles discarded by others on the sale floor and in piles in the change rooms. Go through these piles because technically, they have been filtered by others. Smaller sizes and better selection are usually found here. Just make sure you don't take others stuff and ask if a pile belongs to them first before you dig through it. - Wear modest underwear and bra. The fastest way to try things on is just stripping down to your undergarments and trying the clothes in a corner. - Take a friend with you. There's only one mirror in the change room. Most likely, you won't be able to see yourself and how you look in your clothes. Ask your friend for their honest truth and let them be your mirror. - If there is any doubt, don't buy the clothing item. If you wanted it so bad in the first place, you wouldn't have to convince yourself to buy it on sale - the decision would have been quick and obvious if you knew it was a 'yes'. Don't buy something for the sake of buying something. If you walk out empty handed, that's fine as well. At least you didn't waste your money on something mediocre. - Go into the warehouse sale with an open mind. If you have a set list of things you want to buy, chances are.. they won't have it. Classic pieces are rare to find at a warehouse sale. - Don't bring your boyfriend. It's hell for them. They serve no purpose during this sale so why torture them with boredom. Sure you can persuade them with the idea of girls changing out in the open but it's not like everyone is a Victoria's Secret model changing for a fashion show. My eyes see more unsightly body parts than erotica. - Inspect your clothing items thoroughly! Silk clothing items are prone to snags. Cotton items tend to have holes. 95% of the knitted sweaters I saw had rips and pulls on them. Make sure the zippers are in working order and the zipper pulls are there. - Wilfred and T Babaton wool/winter coats were $150. I saw the Wilfred military trench (greys and blacks) and the Wilfred Howell funnel neck coat (grey, black, olive, dark beige, cream)! Such a good deal. Not anything for the smaller sizes by the time I got in but lots of mediums, larges and XL. - T Babaton second skin tanks for $15-$20 in charcoal gray floral from S-M, beige lace print in S-L, green stripped for $15. - J brand pastel pinks, lavenders, yellows skinny for $100. All jeans (Citizens - thomspon, avedon), Rag & Bone (in burnt orange, yellow, mint, coral, bright red), J brand (pastel colours, regular dark blue, hunter green, indigo blue), Current Elliott leopard print/snack print were $100. Some were $75. I saw a J brand in hunter green for $75. - Lots of those sleeveless and half sleeve T Babaton (or Wilfred?) silk wrap style dresses for $75 down from $165 or $175. Mostly in the colours cream, mauve, purple, plum, black, olive green, sky blue, burnt coral, black star print, burgundy floral and black floral. - Wilfred silk sundresses (georgette silk material) with the ruffles for $83 in sky blue, light pink, mint, bright yellow. - Lots of winter coats/parkas with furry hoods from Talula for $100. Great for winter time. - Wilfred Crepe de Chine parachute pants in dark purple and dark beige for $50. Also the linen versions were $40 in black. Lots of silk dress pants for $50 in general. - T. Babaton dressy blazers for $100 in black, light grey and charcoal grey. The cheapy looking cotton Talula blazers were there too but didn't remember the price. The lightweight Talula blazers in black and royal blue were present as well. Lots of blazers in general. Saw very few Crepe de Chine blazers for $100. It was either a burnt orange/rust colour in a size 4 or 10. I saw one short tuxedo version for $100 in a size 2 but I have the longer version already so no go. - Different styles of Wilfred silk tanks ranging from $20-40. There was the buttoned front slouchy silk tank in mint, hot pink, white, black or royal blue. It didn't look flattering on. Lots of sky blue wilfred u neck silk tanks. - Lots of bright neon pink TNA hoodies for.. who cares I'm not in high school anymore. - Wilfred silk Cannes shorts in lavender, mint and grey for $40. Lots of Mediums and Larges though. I found a grey one in size small. - T. Babaton gauze material sweaters for $40 in sky blue and black. 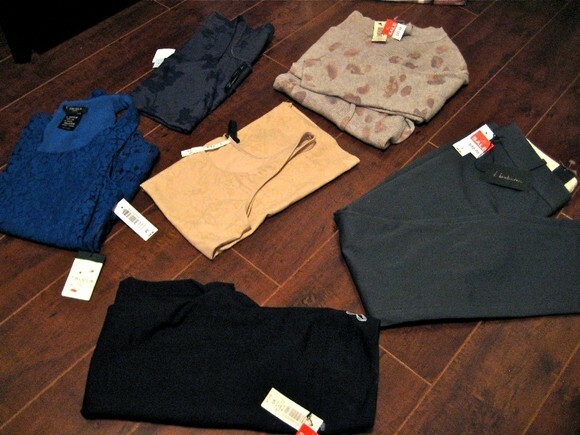 Byline open knit sweaters with long sleeve and short sleeves in taupe for $50 but all had snags on them. - Winter native style wool knit sweaters were $60. In the end, was the sale worth it? Yes and No. Yes if you are on the bigger end of the spectrum (M-L) but if you are XS - S, you will have to be pretty ninja and hunt for longer. But if you like hunting, then it's right up your alley. The sale is more worth it if you are buying bustier tanks and winter coats because there's so many of them. Good luck finding classic pieces though - if you do, it's one of the bigger sizes. Also, size 27 and up in jeans have better selection than 26 and under. There's lots of silk wrap dresses if you are looking for that and believe they are worth $75. There's not much sweaters in my opinion. They claim to bring out new stock everyday. I can't guarantee that you will find the same things I bought so if you see something you like, grab it and never let go. You can decide later if you want to purchase it. Oh yeah so the cashiers forgot to take off 2 security tags off my items, so annoying. Looks like I have to go to an Aritzia store to get them removed tomorrow. ps- love how you posted this so fast! thank you! Awesome post! You found some great items! Wow, great breakdown. Amazed at how detailed you are. I really want one of those silk dresses I believe you mentioned, but not for 75...Aritzia warehouse is usually a disappointment for me, so I might skip out again this year. yeah $75 is still steep for me for a dress i don't have to have. Wow such a detailed post! I just posted my warehouse sale experience but for sure nowhere near the details you just posted so I just had to edit and link you! I love your finds! I saw a few girls with the blob sweaters and tried desperately to find one with no luck :( Are you going to go back again? i had a girl ask me if she could have it if i tried it on and didn't want it. but unfortunately i liked it. i saw another one in a size small hanging on the rack as i was exiting the changing rooms and felt bad that i didn't see that girl again to notify her about it. Nice! Awesome post! Still debating to go or not.. Was there any wool scarf? Boo I wish I went now! My friend works at the head office and always gets me tickets but I turned it down yesterday to workout. :P I only want to get fall clothes and a jacket though. Definitely agree with " Lots of bright neon pink TNA hoodies for.. who cares I'm not in high school anymore." I was trying to explain something about the brands of Aritzia to someone, and with TNA it really is just its named plastered across everything! holy detail girl much appreciated youre the best!